Vera & John is starting the new year with a great promotion. Bonus Blast Off. How it works is that all players are able to claim a weekly reload bonus, each week this bonus percentage will be bigger than the previous week. And in total you are able to claim €200,- in bonuses during 4 weeks. 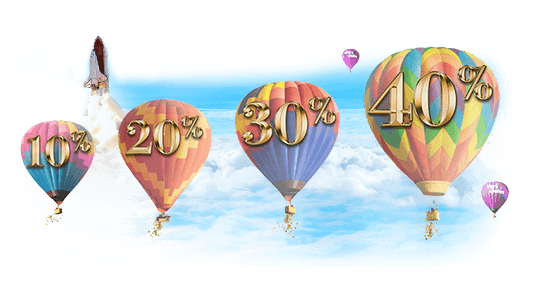 If you use all four bonuses during the four weeks, you will receive a entry into the special Free Spins Tournament where all players have equal chances to win up to €1.000,-. Amungst other great rewards. This Bonus Blast Off promotion started yesterday and will run until the end of January. If you don’t have an account at Vera & John yet. You can sign up and make a first deposit to caim your welcome bonus of 100% up to €100,-. With your second deposit you are then able to participate in the Bonus Blast Off promotion. Vera & John is one of the older, most trusted online casinos. They offer games from many different software providers, including NetEnt, Williams Interactive, Microgaming, Yggdrasil Gaming and many more. They also run a great rewards program that gives you points when you deposit and play. These points can be used in their shop for free spins, free cash and reload bonuses. Hurry up and start your Bonus Blast Off now!